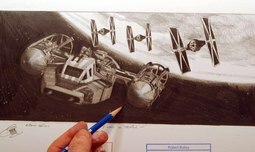 Besides being a licensed Star Wars and Disney artist, Robert is now also licensed for Marvel characters, after having been approached by the Marvel licensor. Characters are mostly The Avengers and Spider Man. Stan Lee, creator of Spider Man, says that Robert is his favorite artist. Besides all these movies and characters, Robert is also creating panels for Breaking Bad, Frozen, Harry Potter, Princess Bride, Games of Thrones, Depicable Me, Tinker Bell and Indiana Jones. 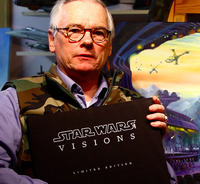 Celebrities who have collected Roberts work include George Lucas, Linda Hamilton, Carrie Fisher, Mads Mikkelsen, Sigourney Weaver, Carrie Elwes, David Prowse, Ian McDiarmid and Anthony Daniels.